April 13: With winds whipping all around Jack Phillips Stadium, miscues needed to be limited and the team that made the fewest mistakes wound up winning each of the games on Saturday as the Clarkson University Baseball team and RIT split a doubleheader, with the Golden Knights claiming a 5-1 victory in the opener and RIT gaining a 12-7 victory in the nightcap. The Golden Knights moved to 12-10 overall and 8-2 in the Liberty League while the Tigers saw their record stay even at 11-11 overall but 6-4 in conference games. The two teams will face one another in a second doubleheader on Sunday, scheduled for a 10:00 am start due to the weather forecast. Clarkson got on the scoreboard first in game one, as a bobble created a forced throw which turned into an unearned run when Nolan Duda came all the way around from first base to put the Knights up 1-0. Later in the inning, Joe Stockman's single stayed inside the line and allowed Mike Nee to score Clarkson's second run. The Tigers picked up a run in the top of the fourth, but it could have been more had it not been for a solid relay. Joey Mylott reached on an error and Daniel Zeglen sent Mylott rounding the bases on a double to center. However, Clarkson shortstop Joe Stockman made an excellent relay from the outfield with a flawless throw to the plate to cut down Mylott for the first out. Although Patrick Blackall sent Zeglen home on a single, the damage was limited to just a single run. Clarkson responded with two in the bottom of the fourth. Mike Messier came around when Kyle Locklear's sacrifice bunt attempt saw everyone safe on a throwing error. Mike Nee then delivered a two-out single to plate another unearned run for the Golden Knights. Clarkson tacked on one more in the fifth thanks to a Michael Tito single which scored Joe Stockman, who led off the inning with a walk. Ryan Riley picked up his fourth win of the season, striking out five of over seven innings with six hits and two walks allowed. Stevie Branche took the loss for RIT, giving up seven hits and six walks in six innings, though just one of his five runs allowed was earned. Clarkson left 12 runners on in the game. In game two, nothing went right for the Knights in the second inning as RIT hung nine when 14 batters came to the plate. Between walks, soft singles, errors, and routine fly balls getting pushed around by the wind, the Tigers gained a huge lead in the early going. Clarkson kept things interesting with four runs in the fourth. Kyle Locklear singled with the bases loaded and Joe Stockman delivered a sacrifice fly to get two runs in and Mike Messier grounded out to drive in a third run. Tito then hit a liner back at the pitcher which bounced all the way into foul play, allowing Locklear to score. Junior Nate Burns, who came in as the third pitcher in the second inning, kept Clarkson in the game with 5.2 innings of scoreless work, striking out seven and scattering six hits. RIT pushed three unearned run across in the top of the ninth to make it 12-4, but again Clarkson kept things alive with three runs in the bottom half of the inning. Nolan Duda drove in one with a sacrifice fly and Brad Pearson scored two with a single to right-center, but the deficit was just a bit too much to overcome as Clarkson fell in game two. 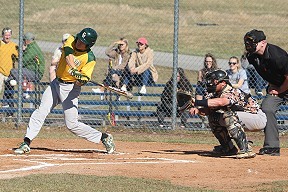 April 10: A Vincent Granuzzo single in the top of the first of game one put the Clarkson University Baseball team up early, but that was all the offense the Golden Knights would get as Oswego State claimed a doubleheader, 4-1 and 10-0, on Wednesday afternoon. The Golden Knights fell to 11-9 overall and will open up the home portion of their schedule this weekend against RIT. Oswego State improved to 17-8 overall. In game one, Brad Pearson delivered a one-out double and then came around on Granuzzo's single two batters later to give Clarkson a 1-0 lead. However, Lukas Olsson plated a run with a single in the bottom of the first to tie the game at 1-1. In the third, Rocco Leone tripled home a run and in the fourth Nick Chilson delivered a solo home run to left to give the Lakers a 3-1 lead. Oswego tacked on an unearned run in the bottom of the fifth to close out the scoring. Mike Bubniak took the loss, tossing two innings before three other relievers were called upon to finish out the game. The foursome of hurlers combined for six strikeouts and only seven hits allowed. Oswego State's Kieran Finnegan gained the win, giving up only four hits and a walk while whiffing seven in seven frames. In game two, Oswego State would never trail, putting up three runs in the bottom of the first thanks to a two-run double from Olsson, who later finished the circuit on a sacrifice fly. The Lakers scored one in both the second and third before Mike Dellicarri hit a two-run shot in the fourth. With the game in hand, Oswego added three more in the bottom of the sixth inning. 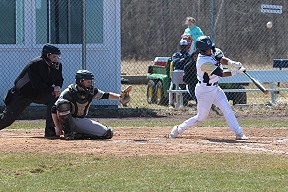 April 13: Brett Hoberman and Brandon Bautista both hit home runs and Hoberman led the Roos with five hits on the day but the SUNY Canton baseball team dropped a doubleheader v. Stevens by scores of 8-6 and 15-2 on Saturday. The Roos jumped out to a 5-3 lead after three innings in the opener behind two runs in the first and three in the second. Stevens tied the game at 5-5 with a pair of runs in the fourth and each team scored once in the fifth. The difference proved to be a Ryan Finegan 2 RBI single in the sixth that broke the tie. Finegan went a perfect 4-for-4 on the day. Hoberman and Brian Santana led the Roos as they each went 3-for-4 from the plate. Hoberman had a home run, double and drove in four of Canton's six runs. Bautista also hit a solo homer for the Roos. Jake Vierno earned the no-decision tossing five innings giving up three earned runs with seven strike outs. Anthony Tur took the loss giving up one earned run in one inning. Alex Smith picked up the victory for Stevens surrendering just two hits and on runs in 2.1 innings. Danny Poidomani was credited with the no-decision pitching 4.2 innings giving up six runs with 13 strike outs. Stevens scored six runs in the third and four in the eighth as they claimed a 15-2 victory in the nightcap. The Roos scored their two runs in the opening inning on a pair of Hoberman and Bautista RBI ground outs. Ben Miller paced the Canton bats with three hits, while Santana and Hoberman had two each. Kieran Gibson took the loss giving up nine runs with two strike outs in 2.2 innings. Ryan Larsen earned the win surrendering nine hits and two runs fanning four batters in eight innings. Tommy Baronner and Donny Gherardi tallied three hits each for the Ducks. April 11: Edward Malinoski, Jr. posted three hits and Brett Hoberman drove in a pair of runs as a late Roos rally fell just short as the SUNY Canton baseball team dropped a 9-8 decision at St. Lawrence University in 10 innings. Malinoski led all players with three hits in the contest and added a sacrifice and walk in six plate appearances, while Hoberman tied a game-high with 2 RBI. Jesse Iacovetta, Ben Miller and Collin Lynk also had hits. The Roos scored three runs in the fifth, four in the ninth and one in the fourth, while the Saints tallied three runs in the seventh, two each in the first and fifth and one each in the eighth and tenth. St. Lawrence earned the walk-off win on a walk in the bottom of the 10th. Canton rallied to score four runs in the top of the 9th to send the game to extras. Brandon Bautista tookt he loss giving up just one hit and two walks in one inning. 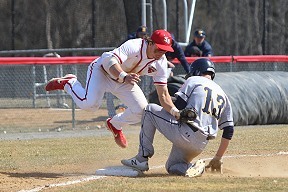 April 13: The University of Rochester built an early lead in both games of a Liberty League doubleheader against the St. Lawrence University baseball team on Saturday afternoon, as the Saints fell to the Yellowjackets 5-2 and 11-4, respectively, on Tom Fay Field. Rookie Andrew Circelli was the lone Saints player with a multi-hit game on the day, going 2-for-2 with an RBI and a run scored in game one. Senior Evan O'Keeffe led the Saints with two RBI in the second game, as he drilled a line-drive home run down the left field line in the third inning. Rochester combined for 27 hits in the doubleheader, with only one of those going for extra bases. 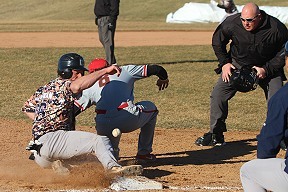 They also finished with eight stolen bases on the day, including four for Kyle Trombley. Game 1 – Rochester 5, St. Lawrence 2 St. Lawrence committed two errors through the first four Rochester at bats in the top of the first inning, allowing the Yellowjackets to take an early 3-0 lead, which, coincidentally, was all they needed en route to the win. The visitors then extended their lead to 5-0 with two runs on three hits and another St. Lawrence error in the top of the second. Starter Alex Black shut down the Yellowjackets in the next three innings, as did Liam Reiner in relief. Black allowed nine hits in 5.0 innings pitched and gave up just two earned runs with two strikeouts. Reiner pitched the final two innings, allowing just one hit and striking out three. St. Lawrence scored a run in both the fifth and sixth innings, first on an RBI groundout by Will Montgomery that brought Circelli in to score. In the sixth, it was Circelli who hit a deep sacrifice fly to the warning track in left field that allowed Taylor Digilio to tag up and come in for the team's second and final run of the game. Game 2 – Rochester 11, St. Lawrence 4 The Rochester bats were out in full force in game two, as the Yellowjackets took a 7-0 lead with seven runs on seven hits in the top of the second inning and led by as much as 9-0 in the contest with two more runs in the top of the third. Six of the seven hits for Rochester in the second inning were singles and Harper Sy capped off the inning with the lone extra-base hit of the day for the visitors – hitting a double down the left field line. In the bottom of the third, with the Yellowjackets leading 9-0, St. Lawrence started to chip away at the deficit with O'Keeffe's line drive, two-run home run that hugged the foul pole to put the Saints on the board. Later in the frame, a double to left field by Montgomery brought Butler into scored to send the Saints into the fourth trailing 9-3. Starter Patrick Greenan took the loss in the nightcap, throwing 2.0 innings and allowing nine runs on nine hits with a pair of strikeouts. He faced two batters in the third before he was relieved by Charlie Pacilio who quieted the Rochester bats and allowed just three hits in four innings of work. He also finished with two strikeouts on the day. The Saints scored another run on an RBI walk issued to Anthony Butler in the bottom of the sixth to pull within five at 9-4, and were threatening to pull within a run with the bases loaded for the heart of the order, but left them loaded to end the inning. St. Lawrence stranded 13 runners in game two, while Rochester left 17 on base. Rochester tacked on two more runs on three hits in the eighth inning to push to the final 11-4 margin. April 11: Anthony Butler worked a walk-off walk in the bottom of the 10th inning to bring Taylor Digilio in to score and give the St. Lawrence baseball team a 9-8 win over SUNY Canton in the Saints' home opener on Tom Fay Field Thursday afternoon. St. Lawrence led 8-4 heading into the top of the ninth, but SUNY Canton managed scored four runs on just two hits and was aided by two errors by the Saints to tie the game at 8-8 and force the extra frame. Sophomore pitcher Kalani Zehr earned his first collegiate win with 1.1 innings of hitless baseball in relief, and finished with a pair of strikeouts – both of which came with two runners in scoring position to get out of the top of the 10th inning. The Saints took a 2-0 lead in the bottom of the first without recording a hit, as SUNY Canton made two errors. Canton scored a run in the fourth and three in the fifth to take a 4-2 lead, but the Saints tied it up with a pair of runs in the bottom of the fifth. 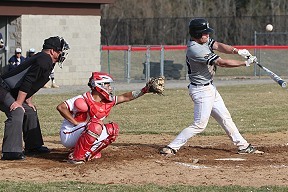 Nicholas Butler, who led the Saints with a 2-for-5 day at the plate, sparked the Saints' comeback with a home run down the left field line to lead off the fifth inning. Evan O'Keeffe then tied the game on a sacrifice fly to center field by classmate Joe DeGuardia. In the 7th, William Montgomery hit an RBI single up the middle and Cristian Forgione blooped a two-RBI double to deep center to help the Saints take a 7-4 lead. St. Lawrence pushed the lead to 8-4 with a run in the bottom of the eighth inning, as Brian Comerford reached on a two-base error before a double to left center by Taylor Digilio brought him around to score. With one out in the top of the ninth, the Saints committed an error on a probable double-play ball that helped Canton score its first run of the inning to cut the deficit to 8-5 for the Roos. An RBI groundout and a two-out, two-RBI single to the left field evened the score at 8-8, setting up Anthony Butler's walk-off walk in the 10th. 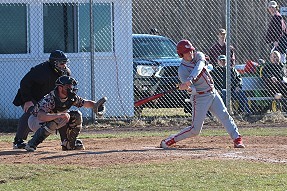 April 28: The Plattsburgh State baseball team was able to close its 2015 campaign on a high note as the Cardinals broke out the brooms and swept Norwich in a non-conference doubleheader at Garrity Field on Tuesday afternoon. GAME ONE: Plattsburgh State 7, Norwich 3 Playing in his final collegiate baseball series, senior Frank Buksa backed Scott Orr's high-quality outing on the hill with three hits and an equal number of RBIs as the Cardinals came back to secure the win in game one. Final-year man Brian Latulipe also added a trio of base knocks to Plattsburgh State's 11-hit assault and scored a pair of runs. Billy Rombauts got the Cardinals' offensive assault going in the top of the second when he laced a one-out double to center field which scored Tyler Bulich to make matters 1-0. Orr was straight up dealing on the hill and faced just 10 batters in the first 3.1 innings before the Cadets conjured up two-thirds of their total offensive output to take the lead in the fourth. A pair of singles by the Cadets set the table for sophomore Brandon Pedley who drove a two-out double to center which scored two runs and put the home team in front 2-1. It didn't take long for the visitors to provide a response, though, as Frank Buksa knotted matters at two-all with a one-out two bagger in the fifth which plated Latulipe. After Mike Vargues took a walk to load the bases, sophomore TJ Montalbano delivered a hit which put the visitors ahead for good. The Dix Hills, N.Y., product connected for a two-run single to center field. A third Plattsburgh State run would score on one of three Cadet miscues. Plattsburgh State remained in front by a 5-2 tally until Frank Buksa scored Latulipe and Ray Flynn with a one-out single in the top of the sixth. Norwich scratched out just one more run against Orr as Tim Dargan registered an RBI groundout in the bottom of the seventh. In order to improve to 6-3, Orr fired all seven innings and gave up seven hits, two walks and all three runs while fanning two. Rombauts was the only other member of the Cardinals who finished with multiple hits by way of a 2-for-3 performance at the plate. Kyle Farquharson suffered the loss for Norwich by surrendering eight hits, one walk and five runs in 4.1 innings. GAME TWO: Plattsburgh State 6, Norwich 3 After a strong relief outing against SUNY Cortland on Sunday, sophomore Andrew Kramer was elevated to the starting role in the Cardinals' season finale and didn't disappoint. The Clifton Park, N.Y., product tossed 6.1 innings of eight-hit, three-run baseball to up his 2015 record to 3-2. All of the runs Kramer gave up came in the first inning and after his work was done the sophomore gave the ball to senior Nick Lupo who toed the rubber and picked up the save. Plattsburgh State's only error of the game led to the first Norwich run and a Billy Whaley RBI single coupled with a passed ball allowed two more Cadet baserunners to cross home plate and up the home team's edge to 3-0 after one inning. 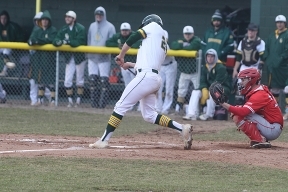 It took until the fourth inning before Plattsburgh State manufactured its first pair of runs in the non-conference battle. Montalbano led off the inning with a base on balls before Jack Tolosky legged out an infield single. After Rombauts was hit by a pitch, Bulich picked up an RBI when he reached on an error. Latulipe trimmed the Cardinals' deficit to just one with an RBI single which plated Tolosky. The remaining four runs for the Cardinals all came around to score in the top half of the fifth. Vargues cranked a one-out double to left field before advancing to third on a wild pitch. Montalbano knotted things at three after reaching on the second of four Norwich errors. That particular miscue allowed Vargues to score. A costly two-out error allowed three more Plattsburgh State runs to score in the frame. Bulich reached on a miscue by the shortstop which caused the bases to clear. Rombauts, Krogh and Montalbano rushed home to account for the final score. After a tough go of things in the first, Kramer settled into a nice groove by allowing just three hits in innings two through seven. Latulipe and Krogh collected two hits apiece in the win while Brian Whaley (0-5) lasted 4.2 innings and was charged with six hits, four walks and six runs in the setback. Plattsburgh State concludes the 2015 with a 14-20 mark and says goodbye to a nine-man senior class featuring the likes of Vargues, Matt Meunier, Lupo, Krogh, Latulipe, Joe Tolosky, Will Flynn, Chris Pescetti and Frank Buksa. Bard at Clarkson (2) ppd. SUNY Canton at St. Lawrence, ppd.